Adopt-a-Beach turns 25 this year, and has a one-of–its-kind data set to show for it. Far from gathering dust, the data — collected by tens of thousands of volunteers —is being put to good use: It’s spurring scientific research, spawning local awareness campaigns, and helping steer national and international marine debris strategy. Researchers like Tim Hoellein, assistant professor of biology at Loyola University, and Sarah Lowe, of the National Oceanic and Atmospheric Administration, are taking the data to the next level. Though NOAA’s Marine Debris Program is celebrating 10 years of work on ocean debris, Hoellein notes there was no similar research on freshwater debris. The Alliance data was just what he and his students needed to launch a study. What they found is that the majority of litter on Great Lakes beaches comes from beachgoers. “To know where it’s coming from gives you the first step to say, ‘OK. What can we do?’” he says. With cigarette butts found to comprise up to half of beach litter, that seemed a good place to start. So, Hoellein and the Alliance are piloting a “voting ashtray” at Chicago’s Oak Street Beach that asks smokers to use cigarette butts to vote for one of two options — such as deep-dish pizza vs. Chicago-style hotdogs. 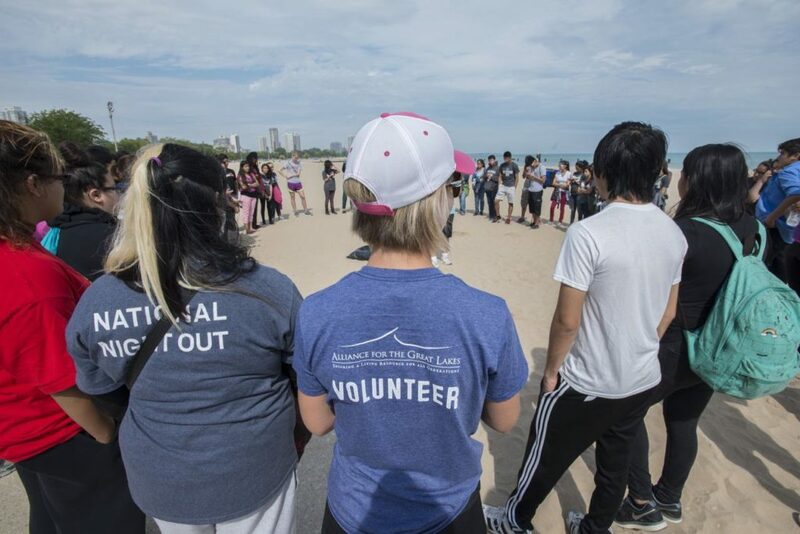 Litter at Oak Street Beach will then be compared with litter on a Chicago beach that doesn’t feature the novel ashtrays to see whether people respond to anti-litter messages that are reinforced in a fun, creative way. Now in the second year of a five-year plan to address Great Lakes shoreline debris, NOAA and its partners are likewise drawing on Adopt-a-Beach data to help find solutions. Lowe, Great Lakes regional coordinator for NOAA’s Marine Debris Program, says the plan itself was driven largely by the Alliance data, which provided a baseline for the problem and even made the case for the action plan. 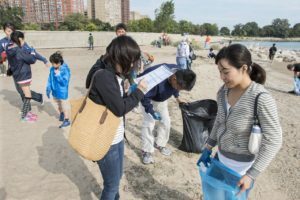 Adopt-a-Beach™ volunteers are having an impact beyond the region, too, adding to an international discussion about the global problem of marine debris. “They have a larger voice because of what they do,” says Lowe. Hoellein says the breadth of work done by Adopt-a-Beach volunteers could never have been accomplished by scientists alone, and has laid a strong foundation for all manner of research into solutions to the problem of Great Lakes shoreline debris.